One of the two largest Harappan sites in India & 5th largest in the subcontinent. 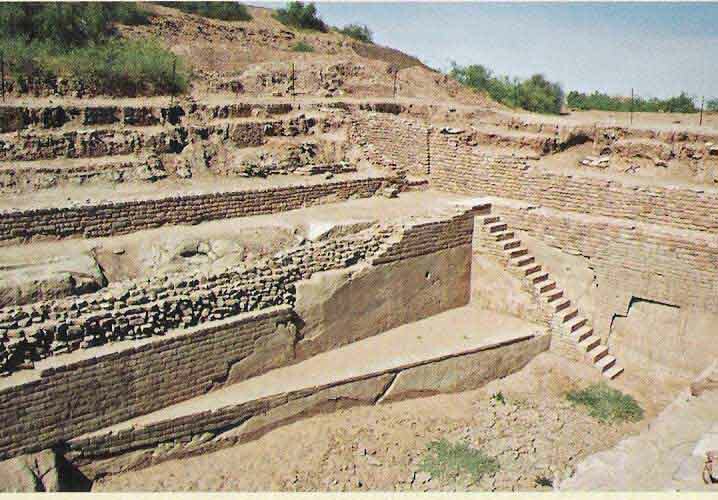 Dholavira has excavations of the Indus Valley Civilization/ Harappan culture. The other being Lothal one of the most prominent cities of the ancient Indus valley civilization. Lothal's dock, the world's earliest known, was a vital and thriving trade centre in ancient times. Popularly known as Kotada, Dholavira is located on the Western part of Gujarat on a seasonal island Khadir bet in the middle of the Great Rann of Kutch. This Harappan civilization is around 4500 years old. It is 300 kms from Ahmedabad. Lothal is more near to Ahmedabad just 80kms away. Air - Bhuj is the closest airport 220 kms away. Rail - Samakhiali is the nearest railway station, 136 kms away. Road - Dholavira is 220 kms from Bhuj and 390 from Ahmedabad. Lothal is 80kms away from Ahmedabad. Dholavira is accessible by road with the nearest point of access being Ahmedabad. Roads from Ahmedabad upto Rapar Town are good, after which, one can only find Kachcha roads. Bhuj - Dholavira is 220 kms away. The route - Ahmedabad - Sanad - Samkhiyali - Chitrod - Rapar - Dholavira - 370 kms/ 6 hrs Roads till Rapar are good. Flamingo Village Resort (Dholavira) & Dholavira tourism resort. To stay near Lothal pick up a hotel near the Ring road of Ahmedabad. Rapar (90kms) has got 2-3 basic hotels near Bus stand. March to May - temp is 45 degrees, hot dusty and dry. June-sept - Monsoon time. Rann is flooded, at this time. .Oct is hot, Nov-Feb is the best time to visit. Nights are too cold. Lots of migratory birds. Both the sites have marked walkways, but not disabled friendly. They are open from sunrise to sunset. Dholavira has a museum with over 300 objects . Kandla sea port is 200 kms. Need entry pass. Gandhidham is 190 kms, The Bhadreshwar temple Jain temple can be seen here.